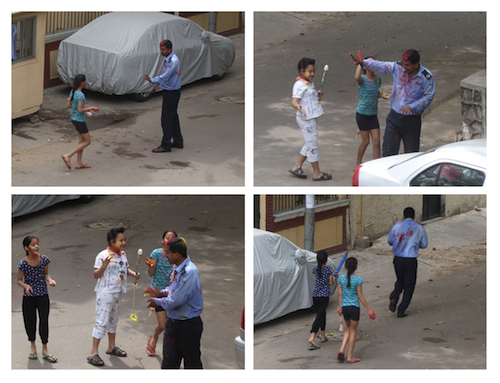 Today was Holi, the Hindu “festival of colours”. Given that I’d already been targetted by local kids with water-bombs and supersoakers last night, I decided to stay home, relax and enjoy my day off. Maybe do some studying. In the end it was way too noisy. Starting from very early. Which was unexpected, as I live in a really peaceful neighbourhood. 7.05am Out of bed and enjoying the unusually quiet holiday morning. Just birds singing; no sabzi-walas or other wandering vendors, and no traffic. 8.44am Neighbours’ sound system stops. Just birds singing. 8.45am More Dhol drums come past. Street dogs barking frantically. 9.00am Two more, one at front and one behind house. 9.06am Suddenly peaceful. A few parakeets screeching. 9.17am Soupcon of a drumbeat returns at low level from neighbour’s soundsystem. 9.25am Another large soundsystem starts up at the JCO’s club on the other side of the park. This one continues throughout the day, alternating between loads of annoying pop-trance that all has the same bassline and auto-tuned vocals, and bollywood/bhangra tunes. Some of the tunes are repeated 5-6 or more times and become very irritating. 9.45am Out-of-tune Für Elise from the steam-powered doorbell thing in the apartment downstairs. 8 bars repeating. Over and over. Presumably waiting for a servant to respond. 9.53am Für Elise finally stops. 2.42pm Music on soundsystem at JCO club actually stops. Faint Bhangra coming from somewhere else, plus quite a lot of male voices shouting in the distance. 3.32pm Actually peaceful. Just birds singing and the laughter from the little kids next door playing in the yard. 5.00-6.00pm Afternoon nap. With earplugs, just in case. 10.04pm Still quiet. Enjoying the peace is only tempered by the worry that the damn sound-system from 3 doors down will come back on again.